What is Taurine and Why do Cats Need It? If you've ever taken a close look at the small print on a bag or can of cat food, you've probably noticed that taurine is among the list of ingredients. Taurine is an amino acid that helps keep your pet healthy and prevents a variety of serious health problems. What Do Amino Acids Do? Amino acids help the body's cells create proteins needed for the proper functioning of every part of the human and feline body. The acids aid in the metabolic process and play an important role in the transportation and storage of nutrients. Although many amino acids are produced by the body, some can only be obtained through food. Amino acids that must be obtained through diet alone are known as "essential" amino acids. Although people and dogs can synthesize taurine from other amino acids, cats cannot. If they don't receive enough of this essential amino acid in their food, their health will eventually begin to decline. How Are Cats Affected If They Don't Receive Enough Taurine? Dilated Cardiomyopathy. The condition causes the heart to enlarge, affecting its ability to pump blood effectively. Cats affected by dilated cardiomyopathy may also develop congestive heart failure as a result of pumping issues. Blindness. A taurine deficiency can cause degeneration of photoreceptor cells in the retina. Unfortunately, once these cells are lost, they can't be replaced. Tooth Decay. Taurine helps your cat's teeth stay strong and healthy. When it's in short supply, cavities are more likely to occur. Reproductive Issues. Cats that don't receive enough taurine may be unable to have kittens. Developmental Concerns. Kittens born to mothers with taurine deficiencies may face growth problems and might be more likely to experience bone fractures. Gastrointestinal Problems: Taurine helps the body produce bile salts needed for fat digestion. Without enough taurine, your pet may develop diarrhea and digestion issues. Hair Loss. Lack of taurine may also affect your furry friend's coat and lead to hair loss. Immune System Disorders. Without enough taurine, your cat's immune system may not function optimally. As a result, your pet might not be able to fight off viruses as easily as healthy cats and may suffer from frequent illnesses. Diabetes. Taurine helps the body regulate blood sugar. Your pet may develop diabetes without sufficient amounts of taurine. Lethargy. Cats affected by the deficiency may appear tired and listless. In some cases, it may be possible to reverse the effects of a taurine deficiency if your cat is diagnosed in time and begins to receive supplemental taurine. Unfortunately, heart and vision changes aren't reversible. How Do Taurine Deficiencies Occur? Eating a diet that doesn't contain taurine is the leading cause of the deficiency. Cats that eat homemade foods or eat a vegetarian or vegan diet are most at risk of developing serious health problems related to a lack of taurine. Although caring pet owners often create special diets in an attempt to help their pets, the diets may actually harm their furry friends. Taurine supplements will increase your pet's supply of the amino acid, but the supplements may not provide enough taurine to prevent health problems. If you feed your pet a homemade, vegetarian or vegan diet, it's a good idea to share the diet with your pet's veterinarian or a veterinary nutritionist. These professionals can help you tweak the meal plan to ensure that it meets all of your cat's nutritional needs. Your cat may also be a risk of a taurine deficiency if he or she enjoys sampling your dog's food. Dog food doesn't contain taurine, as dogs can create their own supply of the amino acid. Although your cat may like the taste, a steady diet of dog food is a bad idea. 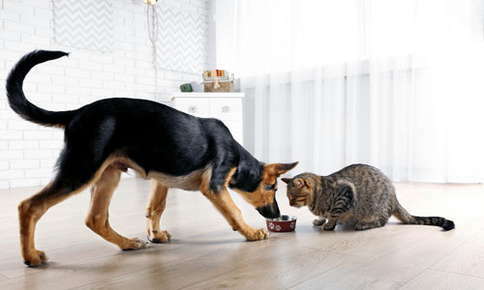 If your cat can't resist chowing down on dog food, feed your dog in a separate room when it's mealtime. Regular veterinary visits are the key to your pet's good health and help ensure that your cat doesn't suffer the devastating effects of a taurine deficiency. If it's been a while since we've seen your pet, call us to schedule an appointment.